Unidentified Flags on this Page. British Attachment on American 35-Star flag? Unknown Flag in Washington D.C.
Pictured are four captured Japanese flags that I can't identify. Can anyone? 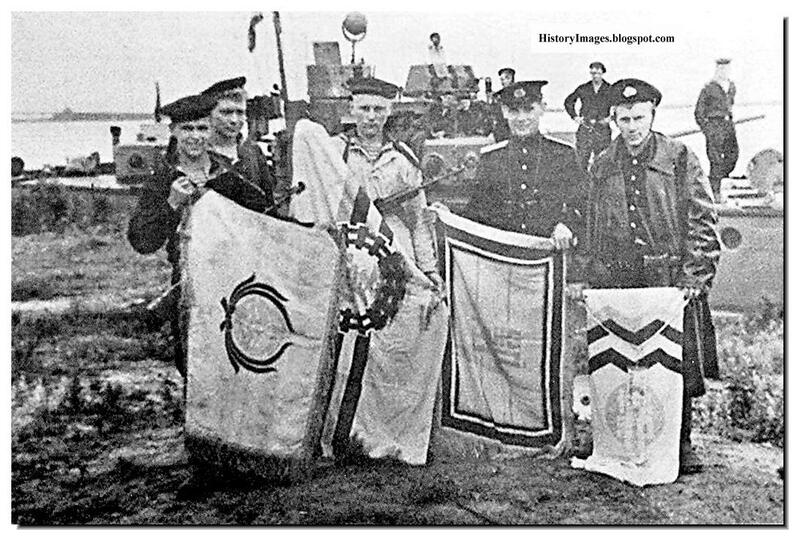 The caption reads: "Russian sailors with captured Japanese flags." There is no other information regarding the photograph, except that the page context is Operation August Storm, the Soviet operation against Japan's mainland conquests, directly following the destruction of Hiroshima in August of 1945. - The flag to the viewers right is the only one that is actually intended to be vertical, but the tag hanging in front of it makes it impossible to read the character. At first sight it would appear to have two zigzag lines, as more Japanese flags have (Does anyone know more about what those stand for? ), but a closer look reveals an extra line above, and the two dark lines might not be the exact same colour. The flag held by the second flag from the viewer's left follow this patterns with its lines as well. Though the colours can't be determined exactly, they would seem to follow the pattern on the flag of Manchukuo. Indeed, this matches the location of Japanese mainland conquests. The "tag" hanging in front of it would probably tell us all we wanted to know, but unfortunately it can't be read in the photograph. - The Second flag from the viewers left has the same colours running as four lines across the flag. In this case the colour of the field really seems a bit darker than what would be the white stripe, so I expect this to be mustard yellow. The order of the lines tells us the Russian sailor is probably holding the flag the wrong way round. The flag is longer even then it would seem; his gun prevents him from holding it up properly. In reality the badge is likely to be in the centre of an 1:2 flag. The structure of the ring gives the impression of a very short circular rail road. That's not the common style for rail road emblems, though, and the flag isn't mentioned on Japanese controlled transport companies (China). It may well have a different meaning entirely, though I can't shake the feeling I've seen it somewhere before. 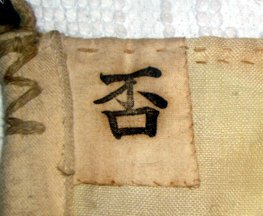 Though the reverse of the flag, the character seems to be correct; at the moment I can't come up with its meaning, though. Anyone? - First to the viewer's left. Definitely saw a wreath like that before, but where? - Second from the viewer's right; I'm tempted to say this one is held the wrong way as well, as the character would seem to read best from the viewer's right. It's still unreadable because of the folds, though. Comparing with the other flags, I'd go for blue thick border, than white then black inner border, with a mustard yellow field and red character. The blue and red aren't all that certain, though. I recently purchased a trunk at an auction that contained World War II U.S. Naval uniforms and there were two flags in the bottom of the trunk. It appears that one of them (White with a blue cross) has a Japanese symbol in one corner. The other flag is square with a red cross no markings. My question is can you tell me what the symbol on the pennant means, what type of flag ? The top flag looks like the signal flag "V" to me, but the blue cross pennant I don't recognise. Far from being even close to reading Kanji characters, it seems to me that it may be the one that mean "no", "negative", "deny"... I seems to remember seeing such pennant in some of the signal flag charts, but haven't found it (in quick search) in any that we have on FOTW. It would probably been used indeed in signaling negative answer. Rob's guess for the square flag is as good as mine... Certainly, both flags looks like part of the maritime signal code. From the top of my head: This is a signal flag from the Imperial Japanese Navy, the Mi pennant. It's hoisted to qualify the rest of the signal as navigation information. I would say that symbol means "Negative". It might serve a double function. Each of their signal flags seems to have combined several meanings. The other square flag with a red cross is the V, as Rob said. If it belong with the other one, it will have had some specific Japanese meanings as well. This morning while watching TV in my hotel room in Abu Dhabi I saw on Qatar TV a military graduation ceremony of the Ahmed bin Mohammed Military College. During the cremonies I saw two flags containing the college's crest. The dimensions of each appeared to be 3:5, and they appeared identical except for the main colors which looked to be a medium olive green and a lighter olive green, almost tan. All services were represented at the parade and ceremony although all the graduates wore the same uniform, so determining what each banner represents is impossible for me. I did NOT see any other flags except the national flag. Sorry for the roughness of the crests. I downloaded them from the college's FB page. Well, here's a better image resolution for the CoA, and here they mention that the first graduates from this Academy were in 2001. Finally, you can see pictures of the Qatar National Day Parade 2012 with some of their flags shown. Today there's a picture which shows what seems to be a political flag, since they were used in the last week of elections according to this BBC article. Can anybody identifiy this flag? A young Moroccan man demonstrated on the statue of Don Juan d'Austria in Regensburg/Germany against the statue. He raised two flags on the statue: The Turkish national flag and a horizontal triband in green-white-green. The newspaper article noted that this flag would be a Moroccan. Does anybody know this flag? Well, it looks a bit like a Nigerian banner, doesn't it? Probably is something else entirely, though. However, I don't see mentioned that the flag is Moroccan, just that the protester was. Strangely enough, its a perfect match to the Naval Ensign of Argentina used by Hippolyte de Boucharda when his two warships occupied Monterey (California) between November 24 to November 29, 1818. The sun emblem was first added to the War and Naval Ensign of Argentina in February of 1818, but de Bouchardas' squadron had already sailed, so they most likely were still using an older version without the emblem. (see: "The War and Naval Ensign of Argentina 1818") Could there possibly be any connection to Argentina at this Regensburg protest? It looks like the flag is on the statue itself, the protester has a the Turkish flag, but his other arm is down and empty. And the green-white-green horizontal is larger too. Looks like it is regularly part of the statue, but this is a guess. It really isn't. The protester taped the flags to the hands of the statue. Could be the flag of Andalusia, just across the Strait. A further note on a possible Argentine connection from the FOTW database: "Before 1985, the citizens had to use the flag without sun emblem. The flag with sun could be raised just by the government and the Armed Forces." As previously noted, the colors on the protestor´s flag match those used on many modern Argentine flags, however, I personally doubt there is any connection here, the colors are most likely just coincidental. While I don't know what the protester intended, the flag of Andalusia would indeed be a logical and plausible partner to the Turkish flag. John of Austria's two most notable achievements were the defeat of the Ottoman fleet at Lepanto and the suppression of the revolt of the Moriscos of Granada in Andalusia. The emblem on the flag in the news photos is very faint, and looks as if it was hand-drawn on the flag. Since the seal is often associated specifically with Moroccoo, perhaps this was intended as a revanchist statement - "Andalusia is Moroccan!" or something like that. 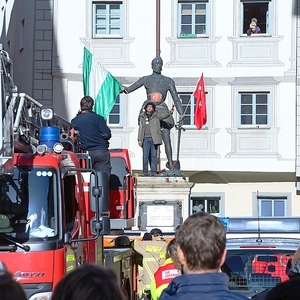 According to "Minuto Digital", 13 February 2013, the man is a Muslim Moroccan who "seized" the statue of Don Juan of Austria in Regensburg and asked for its removal from public space. The man hold the flags of Andalusia and Turkey. The article does say: una bandera turca y otra de Andalucía (a Turkish flag and another of Andalusia). I guess with the addition of a star of David it would seem the most logical that it's supposed to represent Moorish Andalusia. Is it a hexagram or a pentagram? The latter indeed would have something to do with Morocco? Or is it something else - a rdinat sun? In this larger photo I can see the Turkish flag taped to the belly of the statue and the Andalusian flag (defaced with the hand-drawn Star of David?) in the right hand of the statue, but are we sure the flag in the left hand is the Turkish one, all I can see is the red field [and what appears to be something gold in the canton. It could also be a Communist flag, for example]. The explanations are those given by the source, not my own interpretation. It must be an eight-pointed star; with this star (and an "A" in the center) is the flag of Andalusian Assembly, a group that favour the Islamic heritage of the country. Yup: See the Andalusian Assembly Flag. 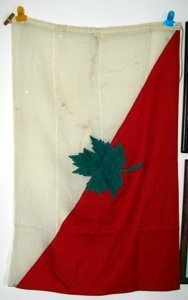 I was wondering if you could help identify a flag for me. I was told at the estate sale where I purchased the item, that it is a Japanese Navy flag from around 1918. It is hand sewn and hand panted. Any help would be appreciated. Attached are some images of the flag. I don't think this flag is Japanese, but I might be wrong. I think the characters are Chinese, and triangular flags are more often found historically in China than in Japan. 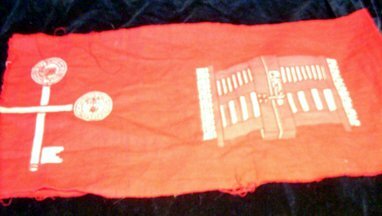 This is probably a Daoist/Taoist religious festival flag from somewhere in China. The writings literally mean "Middle City Triple Compassion Water Festival Flag". 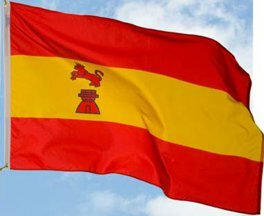 Sent to me off-list - an odd Spanish flag. Any ideas? To me it looks like a parody of the flag with arms as at the lion and castle of Castile y Leon. But is that a lion or a bull? There are also the flags with the red-yellow-red and a plain black bull - see National Flag with Osborne's Bull, Spain. I wonder if this flag is of that type? I think it is a lion - when zoomed in enough, it seems to reveal the mane. This is a manufacturers variant of the Spanish flag adopted in 1785, likely based on a description rather then an image. It is, or was when I first saw it in the 1980s, made by Annin & Co. as a part of a historical set of flags to represent the period of Spanish sovereignty over some part of the southern U.S., Texas or Florida perhaps. It was available full size for outdoor use and as miniature table flag. On a visit to Annin's Verona NJ manufacturing plant in the 1980s. I pointed out that Annin also already made the correct flag for the 1785- 1931 period and that they should correctly substitute that. I was told that this was what the customer had used in the past, this is what they were used to and that this is what they wanted. This is a perfect example of what William Crampton referred to as a suppositious flag - something erroneous, but used do often it is accepted as factual. Many parts of the U.S. use historical flag reproductions to indicate the various ruling powers that held sway at one time or another, not all are historically faithful to the flags actually used in that period, and often their modern replacements are used as a cost saving. 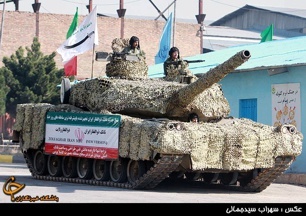 During the presentation of the Zolfaghar (also Zulfiqar) Iran MBT (Main Battle Tank), an Iranian military UFE can be seen on top of this prototype. The flag on a white horizontal background, shows a black Zulfiqar "bifurcated" Sword of Ali with a green inscription I cannot understand. I recently bought a book called "Adolf Hiter" by John Toland (ISBN: 0385037244), and while flipping through the pages I came across some German Flags which I think are German. One Flag (very top on left side) seems to be a Hammer and Sickle which seems like a Soviet Version, but then again it might just be a Communist/Marxist Party flag. Two flags which seem to have a skull and maybe crossed bones?, at different positions on the flag. And lastly a flag which looks like the letter "M", but since it being hung from a window it looks more like the number 3. I couldn't find theses flag on the Third German Empire page or find anything similar to them. I am hoping that someone will identify these flags. It is communist flag, showing hammer and sickle, but it's hanging with the top side next to the building. In addition, enlarging the ones looking like skull and cross bones a bit reveals that they are probably hammer & sickles too. 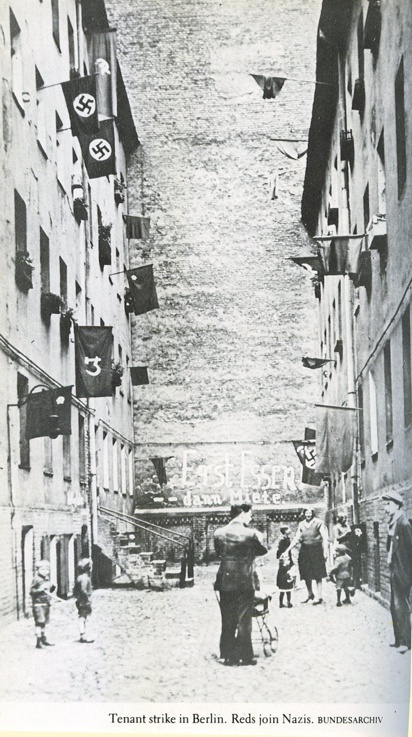 I can't be entirely positive because the images gets too grainy, but that is what they seem to be, and that would match the caption about Nazis and Marxists joining in a tenants strike (obviously before the Nazis took power, when it was in both groups' interest to promote unrest). 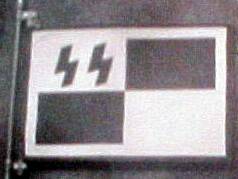 I attach a photo of a strange revolutionary flag from Sao Paulo in 1932. The colors are uncertain. There are at least two possibilities: Yellow-green-yellow (Brazilian colors) and white-blue-white (Federalist colors). I attach here a partial image (only the flag). Any suggestions? This flag is military issue and believed from World War II. The person I bought it from was told it was a Canadian 1st Corps Command Headquarters flag. I have been told that is incorrect. I have since inquired on three boards, but nobody has been able to nail down where this flag was used. I would like to include it in your unidentified section to see if any of your followers can identify this flag. This is almost certainly the 1947 proposal for the Canadian Nation Flag, although the field colours appear to be reversed. Although it has been proposed that this flag is the 1947 Proposed National Flag, it is not the same flag. The colors are opposite on my flag and the maple leaf is a different shape. Can anybody make out what's printed on the hoist detail in #11b? 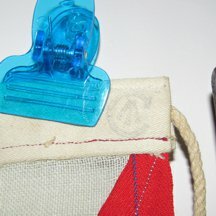 The hoist has the C Broad Arrow stamp that means it is military issue. I have a swallowtail pennant that I can not get any information about (it is 30" X 60"). Can you help me with information on this swallowtail pennant. 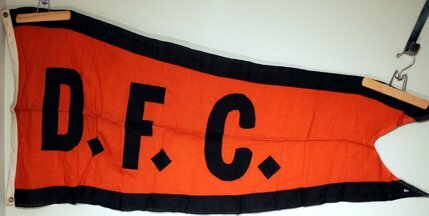 There are other European football clubs with the initials DFC and the same red and black color scheme, so those could be additional possibilities. I came across this British West Africa flag. It measures 16" x 7", and judging by the 1939 reference it is something to do with our presence (I'm ex-British Army) during World War II, but I can't find anything about it…any ideas?? The four British colonies in West Africa were quite separate. The only(?) thing in common was their currency, the British West African Pound. The keys, ‘guineas’, padlocked gate suggest a connection with the Bank of British West Africa. Also see British West African Pound. This flag looks to be of similar style to those produced by the Asafo - African Flags of the Fante, which is a military institution of the Akan peoples of west Africa, mainly from Ghana. In 1992 an excellent book was published about these, and number of these flags featured in a world tour in the mid-1990's. I viewed this exhibition in The Netherlands shortly after attending ICV 16 - Warsaw in mid-1995. 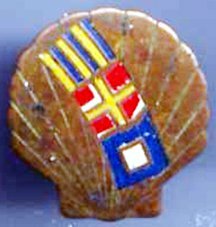 This was identified as a part of a promotion using signal flags to encouraging courteous driving habits in the United States. Now found on the United States Shell Oil Company page. I was hoping you could help me identify this pennant? It is approximately 19 1/2" long x 11 1/2" tall and is sewn together from different sections of cloth. Any information would be greatly appreciated. My guess is that this pennant is associated with a yacht called Venture II, and may be difficult to locate. Well, I agree with Rob that this looks like a name pennant. Usually, a name pennant stays with the ship. It would be interesting to know what Mike's relation to the pennant is, and what history is known about it. There was a Venture II of some fame in the 1950s, I think: An 8-meter yacht that won the Canada's Cup for Canada. Come to think of it, when they changed the rules, I think I saw a mention of it still sailing on Lake Ontario. Might be a completely different Venture II, of course. According to this - "the owner's private signal, a yellow flag with a green ladder rampant. Miss Leiter kept in the color scheme of her private signal by wearing a smart yellow sweater and green dress. The ladder on the private signal, incidentally, is 'Leiter' in German." - The Story of Edgewater House, 1910 - 2016: Nancy Glidden Coffey; p54. The yacht's first owner was Miss Nancy Leiter of Washington, D.C., and her first home port was Marblehead, Massachusetts. Venture II (named Venture until 1954) won the Canada's Cup in 1954, when owned by David E. Howard, and the 8 Metre Worlds (Sira division) in 1989, 1990, 1991. She still sails Lake Ontario out of the Royal Canadian Yacht Club. There are more yachts and boats by that name; all I said was that this was one of some fame. Still, the Corleys didn't own it at the time it received its new name. Do we know yet what Mike's relation to the pennant is? David E. Howard changed the boat's name when he took ownership. I'm reluctant to ask him why as he is now 100 years old. Maybe I should give him a call, but his answer would only extend my entry. I have checked my NYYC records, but found no Ms. Leiter or her private signal. I made a quick drawing of the Venture II Pennant to see if it would turn anything up with an image search, it didn't. Rather than just deleting the drawing I'll add it to this enquiry incase we ever identify this six year old mystery. 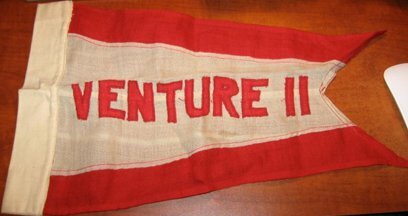 The problem is there are numerous yachts, boats, ships, and even a starship named the Venture II, and this name pennant could belong to any of them. I suggest a quick modification to fix the size and colours. Is there anyone who can do a quick anti-alias? Any yachts large enough to wear a name pennant? It has been suggested that you might be able to identify the defaced ensign and yacht in the attached pictures. If you can help it would be very much appreciated, if I am completely up a gum tree my apologies for bothering you. (Pictures dated 1884. Location Naples). It looks like the badge is a crown above a St. George's cross shield. It probably doesn't help much, but it would seem very likely to be the ensign of a yacht club - one of the many with "Royal" as part of their name. 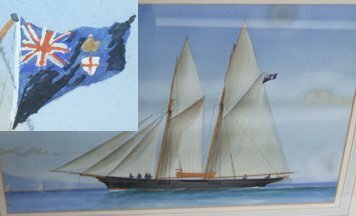 The defaced Blue Ensign, racing rig and apparent tonnage would indicate a fairly substantial private yacht, and the nearest match (to the defaced ensign) I can find would suggest that her owner belonged to the Royal London Yacht Club (with its present headquarters at Cowes)? I don't know on what date this club received an Admiralty Warrant for its defaced ensign (although the club was founded in 1838), and I cannot tell if the red dagger (representing the one that killed Watt Tyler during the Peasant's Revolt, if I remember rightly) appears on the shield's first quarter in the painting. The crown in the painting appears to be a representation of the Imperial State Crown which is correct for 1884, whilst the current pattern shows the King Edward's Crown introduced in 1952, this however, is totally irrelevant since (in my experience) the actual design of a crown was usually not stipulated on such Warrants – these simply saying something like "...beneath a royal crown" which leaves you in a position to use the modern pattern or the one current at the date the Warrant was issued as you choose? A lot of question marks there, but I hope that it is of some use? This flag was flown at Zhukovskiy (Moscow Oblast region) next to an S-300PMU2 missile system on display. 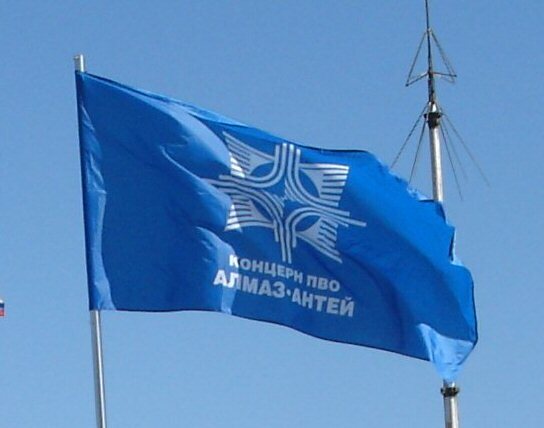 In the picture, taken on Agusut 21, 2005, one can see this blue flag, with a logo and an inscription in cyrillic. Can anybody identify what it is? It's the flag of Almaz-Antey, the enterprise which builds the S-300PMU2. Its Russia's largest defense enterprise. Almaz-Antej, or something like that. A manufacturer of military equipment. Was in the news a number of years ago when someone in the top of the then just created concern was shot dead because of machinations within the company. The details are probably not that hard to find. 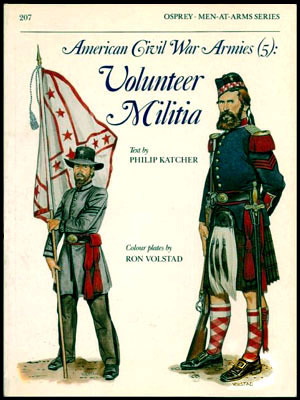 I saw the cover of Osprey's "American Civil War Armies (5)" which has the image of a Confederate soldier holding a battle flag I have never seen before. Its arrangement is like that of the Army of Northern Virginia Battle Flag, but with a white field and red stars, voided saltire and flag edges. The figure holding it has black waffenfarbe which would make him either part of the Confederate medical branch or of a Texan unit. Beyond that, I have no idea what it represent. This appears as plate G3 inside the book. It is the 4th Texas Infantry and the flag still exists. 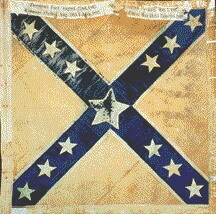 It is a fairly standard Confederate battle flag with red field and blue St. Andrews cross, but the red and blue have faded to white. This fading has led to a misunderstanding that it was originally white, and that error has been copied a few times, including, unfortunately, the Osprey book. The Osprey series are usually quite reliable. 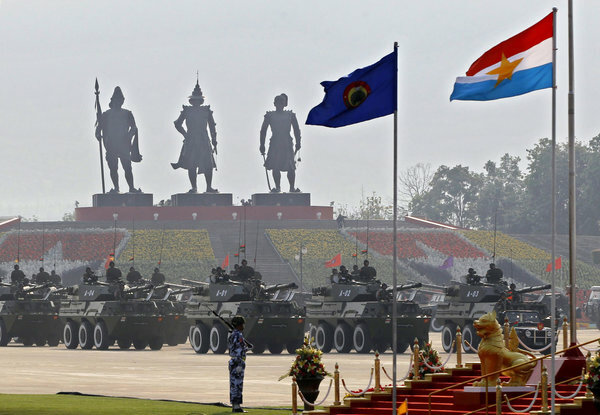 The photo in the (NY Times - March 28, 2013) shows two unfamiliar flags in the foreground as well as a third one indistinctly shown on the tanks in the distance. The foreground flags are unfamiliar to me and not on the FOTW Myanmar army page. Perhaps FOTW might wish to post them as unknown flags clearly in official military use as of March 2013. Does one look like it has a peacock in the centre? I notice also the flag-like design composed by flowers(?) in the background. Trying to get back to something a little bit more serious... The blue flag may easily be an (or the) air force flag, in which case, the defaced tricolour may be the army flag or some such... In any case, and in the view of this flag, it seems that the new national flag has more meaning in the shapes than in the colours, so such colour variations may make sense retaining the national symbolism. Such practice would be distinct to the "western" concept of what constitutes a (national) flag and may be a beginning of new development. But, maybe I am jumping ahead too much from a single unexplained photo. About the three horizontal striped flag with the star, I know it is the Tanmataw (i.e. Armed Forces) flag. The other, I have a photo where this flag is hoisted at the side of an historical flag, but its use is unknow to me. Apparently, Googling around earlier I found this image, placed it in a unnamed folder, but I can no longer remember where I found it or whose flag it is. 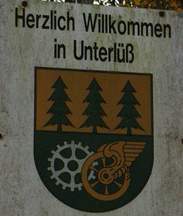 It looks like a German municipal flag, but...? Can anybody assist? Michael, die Google-Suchmaschine war gestern, die Zukunft heißt KMS-Suchmaschine. Gratulation für die Identifikation. This has been Positively identified and moved to Greek Orthodox Church. This flag may have been incorrectly identified. I think the flag is somehow related to Serbia, either the State or its Orthodox church, because the flag displays the 4 B's, according to our page: Serbia: Coat of arms. The meaning of the B's in our page is given as: Βασιλευς Βασιλεων Βασιλευων Βασιλευσιν, that is, "King of Kings, ruling over Kings". This flag is not used in Serbia at all. Regarding the Greek Orthodox Church, the "Byzantine" flag may be more used, but the said flag is used as well - I did encounter its photos several times while exploring the flags of Golden Dawn. The reason for its infrequent use may be that much of present-day Greek territory is still under direct or indirect jurisdiction of the Ecumenical Patriarchate, while the Church of Greece, whose flag it is, has the jurisdiction only over the pre-1912 Greek territories, although it does administer much of "New Lands", as they are called, on behalf of the Ecumenical Patriarch. For more details about this complex situation, see here. Regarding the flag design, the four large charges are not the B's, but firesteels, their shape being something in between the B's and the C's (between betas and sigmas, more correctly). Also note that there is also the inscription "ΤΟΥΤΩ ΝΙΚΑ" - Greek language is not used in the Serbian Orthodox Church, so if it had been a Serbian flag, the inscription would have been either in Church Slavonic or in modern Serbian. And perhaps the most important of all, to repeat once again: the flag is not used in Serbia at all, but it is indeed used in Greece, although not very frequently. I read it more as saying that some parishes use the Byzantine Flag as a symbol for Orthodoxy in Greece. The need for such a symbol would be that the country of Greece is ecclesiastically divided over three Orthodox churches. The actual Greek Orthodox Church we document as using a red flag bearing a yellow cross, with among other symbols B-like fire strikes in the quarters. Unfortunately, though we have photo's showing the flag, we don't have an image to show in the text. The four B-s are really what shows it's more a Greek Orthodox Church flag, as I see it. I would say that in Serbian symbols, the fire strikes look like four C-s. The UFE has fire strikes looking like B-s, which is more Greek/Byzantine. The original UFE request was posted by Jens Pattke; the source was das Erbe unserer Welt, unfortunately without any reference to the issue but the page was 122; the identifier was Tomislav Todorovic. Michael is correct about this flag sometimes being incorrectly identified. Actually I believe this is sometimes used as a fantasy flag to represent the Byzantine Imperial Empire, but apparently also sometimes used by Greek Orthodox churches? Here's another source identifying it as Greek Orthodox and two more photos from Greece (source #2) (source #3) These two sources do incorrectly attribute it to the Byzantine Empire, and the flag is indeed often incorrectly offered for sale as such. It is done partly because the Orthodox Church, especially the Ecumenical Patriarchate, had been considered to be a sort of spiritual successor of the Empire after its end, and partly in order to appeal to underinformed potential buyers. The flag would have indeed been a fantasy flag if it had only been described as the flag of Byzantine Empire, however it does have a user in real life - the Orthodox Church of Greece. The same would apply for the yellow flag with a double-headed eagle, only its real-life user is the Ecumenical Patriarchate. I stand corrected - not fantasy - a poor word choice on my part. Anyway, hopefully the addition of the above flag image to our Greek Orthodox Church page would remove some of the confusion.